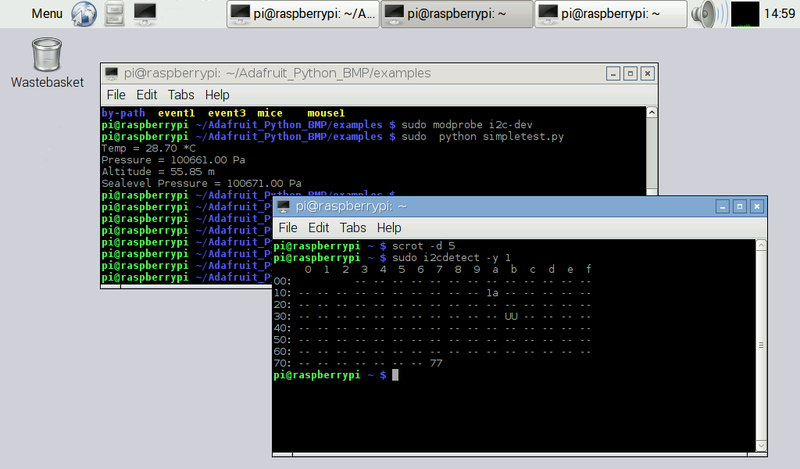 Figure 1: The Raspbian desktop, showing pressure, temperature, altitude. Click to enlarge. I “installed” the BMP180 board into the little tablet enclosure, using only one screw without a nut. Yes – I fully intend to put the other one into the board. The Pi2 board needs one as well (and they’ll both need nuts!) There is some floor area inside of the enclosure that is normally not good for anything, because of the posts that connect the top and bottom halves of the box. Only something as small as the BMP180 fits into the space. So, I connected the BMP device to the expansion header of the Cirrus adapter, using conductive gel to “glue” the female header pins onto both sides of the connection. How did it work? Well! 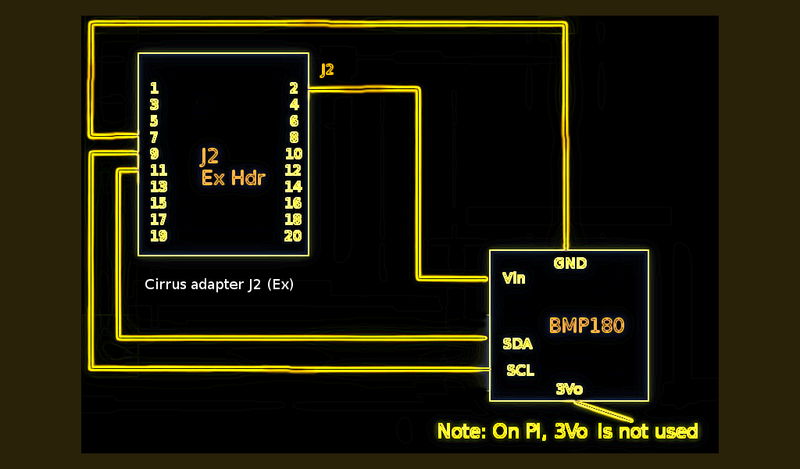 In fact, the internet lore about I2C devices conflicting with the audio card are not yet warranted, IMO. I have temp, pressure, and altitude readings, and audio as well, with no reboots necessary! Figure 3: The Cirrus adapter is piggybacked onto the Pi2, and it’s the adapter’s expansion header that we use for the BMP180 connections. Note: This author and site is not affiliated with the Raspberry Pi in any way. For informationabout those projects visit http://www.raspberrypi.org. “Raspberry Pi” is a trademark of the Raspberry Pi Foundation. The BMP180 is a product of Adafruit Industries, and can be viewed at https://www.adafruit.com. This site and author are not affiliated with Adafruit in any way. Cirrus Logic makes the audio board shown, and is not affiliated with this site or author in any way. Figures 1,2 contains elements of a desktop system and associated programs that have been released under a free software license (Copyright: LXDE team: http://lxde.org). As a derivative work of that program, the respective part of the screenshot in figures 1,3 fall under that same license. The full text of the licences (GPL 2.0+ and LGPL 2.1+) may be found at http://www.gnu.org/licenses/old-licenses/lgpl-2.1.en.html and http://www.gnu.org/licenses/old-licenses/gpl-2.0.en.html.